First Stage: The lift of the barbell from the floor to the point at which the second pull is initiated (ideally around mid-thigh). Second Stage: The final upward extension of the body to accelerate and elevate the barbell with the legs and hips (from about mid-thigh to the full extended position). Note that some coaches and literature consider the transition (scoop/double knee bend) as its own phase between the first and second pulls; I include the transition in the second pull because it occurs directly as a result of the action of the second pull). Third Stage: The active movement of the lifter under the barbell into the receiving position. 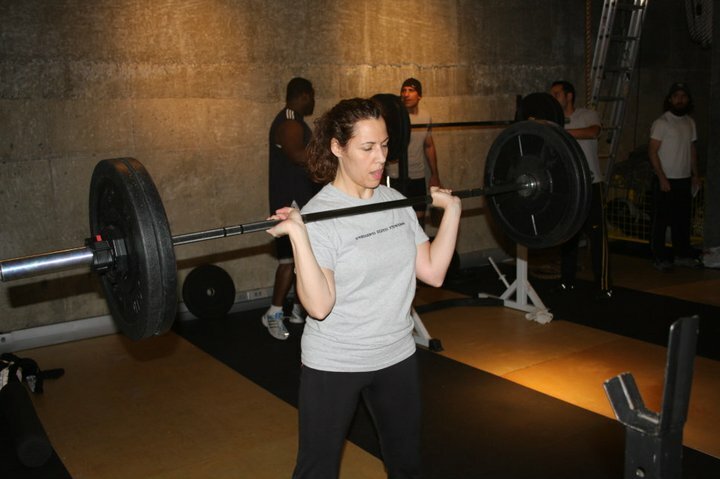 The basic movement of the first pull brings the lifter from the starting position—weight balanced over the whole foot and shoulders directly above or very slightly in front of the bar—into the second pull position—weight balancedslightly more toward the heels, shoulders in front of the bar. The bar will move backward toward the body somewhat (how much depends on the height and proportions of the lifter and how that influences the starting position of the bar relative to the foot), and the shoulders will move forward over the bar as the hips move toward as the knees extend.